So I cracked and I bought a TomTom ONE XL GPS unit off buy.com, simply because I was caught in too many situations where I was driving around in the US (Canadian citizen, working in the US, keep that in mind). So I wanted a unit that would be both great for the US (Michigan area) and Canada (Windsor Ontario and surrounding area). I have owned a Garmin StreetPilot 2610 (which I am trying to sell on Craigslist and Kajiji (but people keep low balling me for like $80 bucks!? ), but that’s another story. Anyways so I got this TomTom XL. I ended up getting it refurbished for about $140 (Sept 2008). I have so far had a week to review it, I got to drive to work with it daily, and have tried numerous voice ‘actors’ on the TomTom. Basically, you get a GPS, that is subpar to say a ‘Google Maps’ view. But it is great for driving directions, because it gives you proper directions to follow. Plus I can export maps from Google Maps to my TomTom easily. Small and lightweight, comes with a cool suction mount that holds the unit very snuggly on the windshield. No annoying nagging that you are ‘deviating’ from route, it just quietly re-calculates your route and gets you around where you need to go, my Garmin would hoot and beep at me that I was “OFF ROUTE!” and it was “RECALCULATING!”. Poor battery life (2 hours!? my iPod does a ton better, surely TomTom could have had more). Poor voice acting for free download voices. I expected ‘Madonna’ or ‘Mr.T’ but what I got was a guy trying VERY hard to sound like someone he wasn’t. So any torrents out there that have ‘legit’ voices for the TomTom, are just cheap knock offs. I am however happy by selecting John Cleese (Monty Python fame). So its great to have a brit directing you around. Lack of ‘satellite’ topography ala Google Maps. I guess I am spoiled rotten by Google Maps, because I expect a richer detail on a GPS nowadays. The TomTom XL is a great little GPS unit, it is cheaper than its more expensive “I’ve got a ton of features” siblings. And it does what is advertised, get you from A-B, and maybe C in between if you need to deviate. 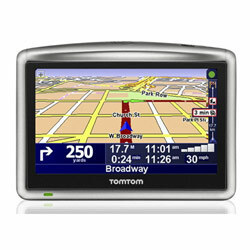 I am overall happy with my purchase and look forward to getting lost with the TomTom together. The battery life like I said leaves something to be desired.